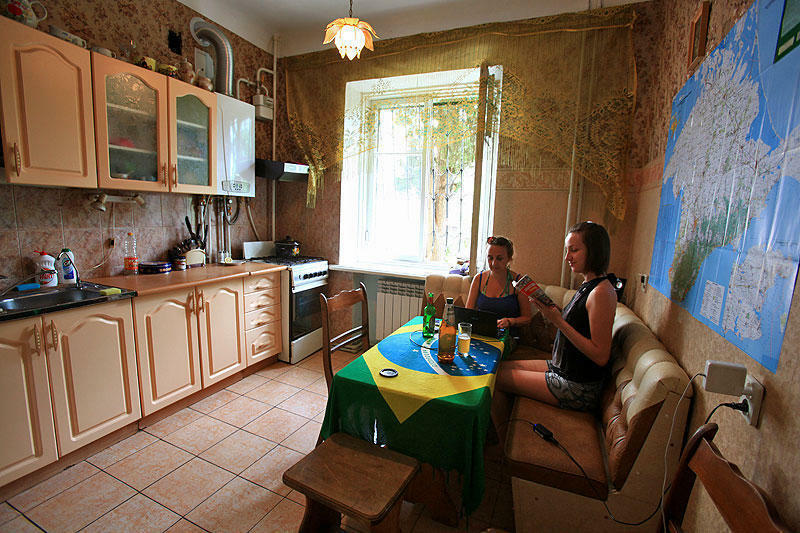 Just the best backpacker hostel in Sevastopol. Experience and local knowledge is what really counts...and we are open again this summer and are ready to do it all again for you. Come to a real hostel with a real backpacker environment. Don't put up with overcrowded accommodation, apartments pretending to be hostels, or with hosts who only turn up occasionally. TIU Bolshaya, is part of the TIU chain of backpacking hostels. Backpacking...We live it ,we love it! We are the easiest to find, and most centrally located hostel in this fantastic Crimean port city of holiday and history. Located on the main shopping street, Bolshaya Morskaya, right next door to one of the largest and most impressive landmarks in the city, The Cathedral of the Protection of the Blessed Virgin (Pokrovskiy Sobor)...The bus stops almost out the front! At one end of Bolshaya Morskaya there is a McDonalds, the seafront plazas which leads to many of Sevastopols historical monuments and at the other end is the Historical Boulevard containing the famous Siege of Sevastopol Panorama.and in between is a myriad of the citys bars, restaurants, and shops for you to lose yourself in! We have a bakery next door, a 24 hour supermarket around the corner, and the main open air market at the bottom of our street. Our hostel consists of; a large, light, and airy 8 bed Dorm Room with a small private balcony overlooking the garden and the cathedral; ...one Private Double Room with a TV; ...a Common Room with a large Plasma Screen TV and a Movie Library; ...a bathroom w/ toilet;... and a fully equipped kitchen, where the guests can prepare their own food. We have no Curfew or LockoutYou can come and go as you please and your hosts live on site to deal immediately with your questions and needs. We have a safe to store your documents, valuables, ipods, computers, or camera equipment. There is a hostel computer with Skype and headphones for you to use or a free fast WiFi internet connection if you have your own laptop/PDA. and First Aid equipment on the premises. Secluded Crimean Beaches & Swimming Spots. hostels if you wish to travel further in Ukraine. TIU hostels are the original chain of the Ukrainian and Western owned Backpacker Hostels in Ukraine - this means you are getting world renowned Ukrainian hospitality with Western style service and management. We are a traditional Backpacker and Traveller Hostel. We do not cater to romance tourists and their internet brides. We advise that you should make other arrangements if this is the purpose of your visit. We have ZERO-TOLERANCE policy regarding, drunken or abusive behavior and bad language directed towards our guests or members of the staff. PLEASE WRITE DOWN OUR CONTACT NUMBER SO YOU CAN CONTACT US SHOULD YOU HAVE ANY PROBLEMS.....24/7. Take a 7, 17a, or 29 bus to Bolshaya Morskaya and get off at the stop which is just past Pokrovskiy Sobor (The Cathedral)..
From the TRAIN STATION its the same buses to the Cathedral (Pokrovskiy Sobor) on Bolshaya Morskaya..
Just to be sure always ask the driver for POKROVSKIY SOBOR on Bolshaya Morskaya ...its the easiest way! If you look directly across the road you should see the blue neon sign of the TELL ME phone shop this means you are in the right place! Walk through the gate into the courtyard behind the building. We are the first door on the right as you enter!